This isn't the end of this kit, yet. I will be back with more! How about a couple sneak peeks of the Cocoa Daisy March Kit? Its called Grey Street and its chock full of greys and rich greens and blues with pops of red and yellow. Cocoa Daisy's reveal night for this month has been bumped up a couple days due to the shorter month, so mark your calendars for Feb. 26th. We hope to see you for the gallery reveal and chat, starting at 8pm. Hey hey! I have another post up on the Chic Tags Blog today. Stop by and read up on the details of my Currently reading layout. I hope you're enjoying your weekend. I just wanted to stop in and share a layout I made using some Chic Tags goodies and a sketch. The sketch is posted on the Chic Tags blog, you can find it HERE along with more examples of how it could be used. You can find a complete supply list on the Chic Tags blog post(link above). My first official Chic Tags post is up on the BLOG! Here's my layout but you'll have to stop over there to see how I incorporated some hidden elements to my page. Paper Issues- Fill 'er Up! Paper Issues has a new theme and linky party starting today, and its called "Fill 'er Up". For my project, I wanted to create pockets and fill them up. So I created a large pocket by sewing some vellum to my background paper. The left 2/3 of the pocket was filled with punched hearts and sequins, then sew up tight to keep it all in place. The right 1/3 of the pocket is open at the top to house some Project Life style journaling cards. I layered on a few tags and die-cuts, my photos, a gold doily cut from some printed vellum, and my title to finish it all off. 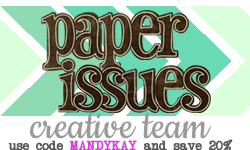 Be sure to check out what the other girls did for the "Fill 'er Up" theme and link us up to your project, on the Paper Issues blog. 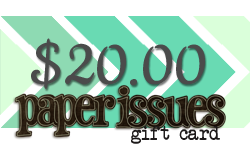 You could win a $20 gift certificate to the store!